We restart mid April 2019 – reserve your place today, as places are limited ! 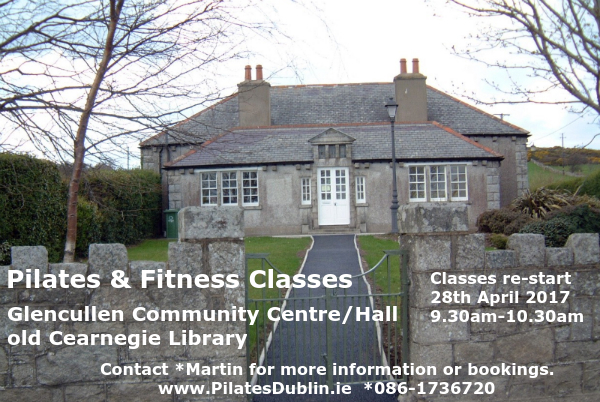 Our Pilates classes and courses take place in the *old Carnegie library* occasionally referred to as Glencullen Community Centre / Hall. The class venue is on Ballybetagh Road, beside St. Patrick’s National schools and Johnnie Fox’s pub, close to Dublin 18, South Co. Dublin. Most of the exercises are Pilates-based, some are body-weight exercises. I will bring small pieces of equipment along, so you can try them as well e.g. a Gym or Pilates Balls, Gym Sticks, light-weight Kettlebells, Medicine Balls and other items. My main goal is to show you how easy it can be to stay fit with various simple exercises, once you do them regularly. And having a few friends around that join in and have the same goal makes the whole thing much easier and more fun. Please spread the word and ask your friends to join in. Find a Street-View of the Glencullen Carnegie Library here and a normal street map here. (1) We restart in April 2019 ! ( if availability allows, please contact us before you plan to come along). Contact Martin with any questions you might have or for class bookings. Please fill out a health screening form before you join and bring it along to your first class.